Update Aug. 15 -see my "Comments & analysis" at bottom. i.e. take HobNob straw vote results with a grain of salt and don't believe they are accurate. Note: This HobNob was organized by the Lake Leadersip alumni, so thanks for doing so! 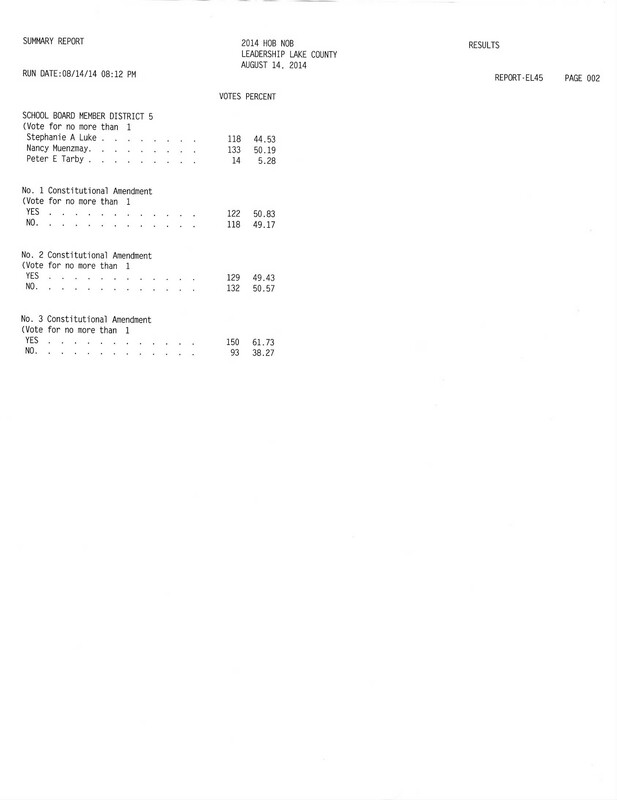 The results of the world renowned Leesburg, FL election candidate hobnob for Lake County candidates are out and I have uploaded scans of the results and pictures at my FiscalRangers Facebook page. Top LOCAL winners were Dan Webster, Thuy Lowe, Randy Glisson, Leslie Campione, Adam Dufresne, Mary Hatcher, Terry Neal, Bill Mathias for Lake County School Board, Tod Howard Lcsb, and Nancy Muenzmay. Amendment 1 was 50.8% yes, Amendment 2 was NO 50.57% and Amendment 3 was YES 62%. Democrats had their own separate hobnob so many of them did not attend this event. I have uploaded about 27 pictures of the events on the FiscalRangers Facebook page HERE. Comments about the HobNob added Aug 15. 1. Jennifer Sullivan was 2nd behind Randy Glisson for the FL House District 31 race, nd the Glisson victory should be analyzed - He paid $250 for a table and right to hand out brochures and supporters to wear T-shirts. That is normal, but Sullivan made a decision NOT to buy a table so had no brochures, T-shirts, etc. and still came fairly close. BUT, as other people pointed out to me, Glisson supporters with his T-shirts were hanging out right by the door to the voting room and a reliable person said they were talking to people as they enter. If this was a real voting site, you would expect other candidates to file complaints and appeals. Experienced candidates know that the normal election rules for voting sites require supporters to be at least 100 feet away from the entrance to the voting site. Allowing Glisson supporters to be so close, and button hole people as they enter the voting room seems improper. I myself saw one leaning about 8 feet from the registration desk, and THREE of them with Glisson T-shirts in the same spot when I left the room. In a HobNob, is that unethical, or fair to "game" the system because the organizers didn't specify rules on distance from the voting room? You decide. (Disclosure - I am a supporter of Jennifer Sullivan). 2. The Democrats boycotted this HobNob which has always been non-partisan, and held their own in Tavares. FL House District 31 candidate B. Grassel was not at this HobNob and I was told, even though she is registered as a Republican, she was at the Democrat event. Since that race is an "open" race where Democrats can vote for any of the 5 Republicans in the race, is it good strategy to skip a well known HobNob to cater to an opposing party? You decide. In contrast to this HobNob, Democrats clearly attended an earlier HobNob in Clermont because the YES for Amendment 1 was much higher. 3. People who had tables at the event and had supporters with T-shirts and brochures did well. That is sometimes referred to as "buying the straw poll vote". So, you have to know how to play the game for HobNobs. In some cases a candidate may pay entrance fees for all his supporters and their votes run up the counts, while less skilled candidates may not be competitive. 4. NO candidate for Democrat Corrinne Brown's US Congressional gerrymandered District 5 were at the HobNob, but amazingly, Lake County Republican resident Thuy Lowe won that straw poll with 52% of the vote vs competing Republican Glo Smith (33%) and incumbent Democrat Corine Brown. And, most attendees probably don't even live in that east Lake County portion of District 5. Many locals know Thuy Lowe from a prior election race in Lake County. 5. A recent HobNob in Clermont listed Lake County Commissioner Sean Parks on the ballot, although he had no opponent. So, they said he won 100%. He was not on the Leesburg ballot. However, both HobNobs calculate percent based upon total votes for the specific position, and not a percent of total ballots. Thus Sean got 100% of votes for his position, but it was probably only 60% of the TOTAL possible votes cast by different attendees. The Elections staff printed voting results report does show 279 BALLOTS cast but does NOT show each candidate' percent vote count as a percent of total Ballots, thus the percent numbers are misleading. For instance, for Amendment 1, only 240 out of 279 ballots had a yes or no vote, indicating 39 non-votes did NOT vote either way for the Amendment. You might say the 39 people voted "Don't Care" or "I don't understand". 6. Plants from any groups (i.e. Yes on Amendment 1) can attend these HobNobs and are there to vote just for one or a few candidates or issues. You can tell if there are high total votes for some issues or candidates, but then other races or issues have lower total vote counts. 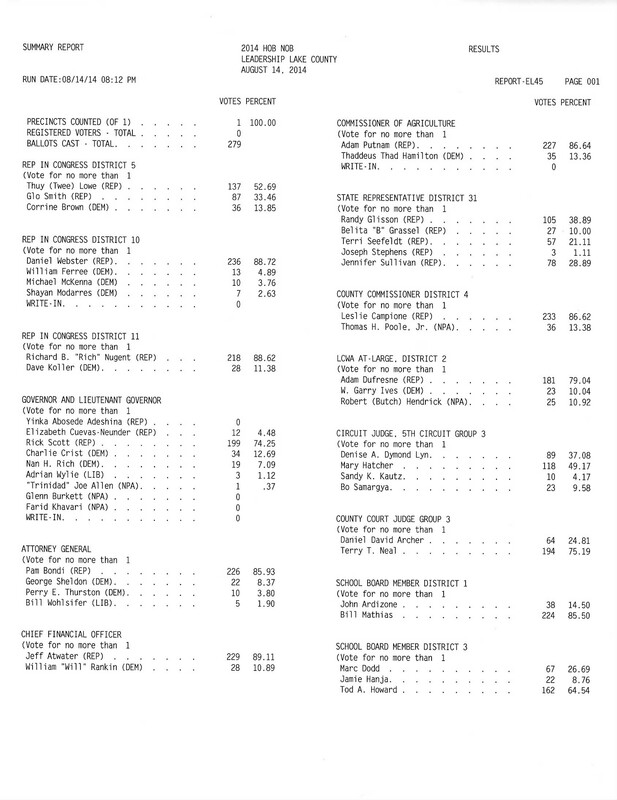 If there are only two partisan choices for a vote, you can tell the partisan party split, such as the votes for Commissioner of Agriculture, where there were 86% of the votes for the Rep. incumbent, and only 13% for the Democrat opponent. The above reasons are why I recommend you take results of HobNobs with a grain of salt. HobNob votes are popularity contests and results can be manipulated. If the mainstream press reports figures like this without describing factors like those above, then you know they are not doing their job.